This body, situated in Bradford county, Pennsylvania, was originally known as the Burlington Baptized church. That part of Burlington township in which were most of its members, and where its house of worship was located, having been erected into a new township, called Troy, the church after a time changed its name, and, since 1822, has been known as the "Troy Baptist church." About 1799, a church of the same order was founded on the Towanda creek, and another also on Sugar creek. The latter was of short duration, and the former changed its name and location so often as to have almost lost identity. The same may be said of the Alba-Canton interest. So that the Troy church may perhaps be regarded as the oldest, and Smithfield, (organized two years after Burlington,) as the second oldest, continuous Baptist organization in the county. "In the year of our Lord 1808, a number of brethren and sisters came to this place, from Vermont State—among which, were Eld. Elisha Rich, and his son, a preacher—and dwelt in this wilderness a few months, feeling themselves as scattered lambs among wolves, and also feeling themselves weak and feeble. Finding a goodly number of professors in no Gospel travail, things were trying to their souls. They often desired a visit from the Holy Spirit of God, to gather them together. Eld. Rich and his son preached in the place—but nothing especial occurred, until about the first of November, 1808, when Jesse Hartwell,* a missionary from the Massachusetts Baptized Society, visited us; whose labors seemed to us like cool water to thirsty souls." *Born in Rowe, Mass, February 27, 1771—Died in Lake county, Ohio, November 21st, 1860, in his 89th year. His son, Jesse Hartwell, D.D., born in Buckland, Mass., in 1795, died in 1859, while President of the University at Mount Lebanon, Louisiana. Both were able and laborious ministers of the New Testament. "Monday, Nov. 1, 1808—Rode from Tioga Point (Athens) up the Chemung river twelve miles to Eld. Goff’s. Tuesday, Nov. 2, rode with Bro. Goff and others to a place called Sing Sing, fifteen miles further up the river. Nov. 3, preached before the Chemung Association. "This is a very needy country, and calls most loudly for missionary labor of any I known of in all the western part of our land. "Friday, 5th, rode up the Chemung river twelve miles to Post Town (Painted Post)—preached five times. Nov. 8 rode back to Sing Sing, and preached at 10 o’clock. Then rode eighteen miles to Eld. Goff’s, and preached in the evening. Rode this day thirty miles, and preached twice. "Tuesday, Nov. 9, rode seventeen miles, through dismal woods, with scarcely any road, to Sugar creek, expecting a meeting at 2 o’clock; but my appointment had not been received. I was fatigued, weary, and almost sick, and very glad to rest; but I am not willing to live for nothing. "After preaching a number of times on Sugar creek, I crossed the Highlands to Towanda creek, and following that down to the Susquehanna river, I went on preaching once, twice, and three times a day, until Tuesday, 15th, when I returned to Sugar creek. "On Wednesday, Nov. 16, after I had preached from Psalm 27th, 4, a number of brethren and sisters, lately moved into that wilderness, and some who had been long mourning in a lonely state, came forward with letters of their standing, made a relation of their Christian experience, and adopted the Sandisfield Articles of Faith. By the advice of Eld. Rich and a number of brethren from a distance, I gave them the right hand of fellowship as a church of Christ, commending them to God and the word of his grace, which is able to build them up in the most holy fait, though in this wilderness. On this occasion, our hearts were enlarged, and our souls filled with brotherly love. It seemed somewhat, I imagine, like Paul’s bidding his brethren farewell—we talked and prayed till midnight, and almost break of day. This was a season of comfort to many souls. I tarried the next day, and preached, and baptized an old man who was added to the church. "I have been gone, on this journey, eighty-four days—have ridden ten hundred and seventy-six miles, preached one hundred and three sermons, and heard five—attended five church meetings—and seen much of the goodness of the Lord." *This was probably the second—if not the first—distinctly Baptist periodical in America, the first number appearing in September, 1803, in book form. Originally, it comprised only two numbers, of 32 pages each, per year. The issues were subsequently increased to three, four, and finally twelve, per year. It is still published, in Boston, as the American Baptist Missionary Magazine, devoted to the foreign mission work. The early numbers embalm many memorials of the self-denying ministers, sent forth to plant the standard of the cross on our frontiers. It also narrates the conversion to Baptist views of Messrs. Judson and Rice—the growth of the mission spirit among our people—and the workings of the General Convention (and Union) to this time. In its constituent membership, the church was very small (not exceeding Noah’s family in the Ark). It consisted of eight individuals, namely: Eld Elisha Rich, Elisha Rich, Jr., Russel Rose, Moses Calkins, James Mattson, Phoebe Rich, Pegga Rich, and Lydia Rose. "Church met, March 25th, 1809—After the usual devotional exercises, and the reception of two persons as candidates for baptism, voted to choose a committee to search for a place for a grave-yard, and a suitable site for building a meeting house. Aaron Case, Elisha Rich, Jr., John Barber, and Eli Parsons, were chosen as that committee." We turn over a leaf of the same book, and find the following suggestive item: "May 6th, 1809—Church met in the meeting-house—opened by singing and prayer." It will be observed this last record was made just one month and thirteen days after the appointment of the building committee. The house was built of hewed logs, with galleries on three sides, and is said to have been a neat, commodious and substantial structure for those times. The site of this original rallying place for the church, was within the limits of the old Cemetery, one mile east of the present village of Troy. The building has wholly disappeared, and with it all the constituent members of the church, as well as the greater part of those who in early times worshipped within its consecrated walls. In those grounds they repose, awaiting the coming of their Lord; there are the treasured jewels of very many of the villagers, and of the inhabitants of the country around; and to that spot look many of the living as the place of their final rest. The present, larger house of worship, in the southern part of the village, was constructed about 1832. The church has had mingled seasons of prosperity and adversity. Peace, and consequent advancement, crowned the fist two years of its existence. During that period, its membership was increased from eight to ninety—sixty of whom were baptized into its fellowship—an increase not surpassed in the history of our denomination in this country, considering the sparseness of the population. * Since that time, the church has enjoyed other revivals, and many precious souls have been gathered into the kingdom through its influence. Including the present incumbent, it has had twenty-two pastors. May its coming years be more glorious than its former! *In 1819, Smithfield reported 86 baptisms. The same year, Columbia reported 59 baptisms, and 28 the year following—87 in two years. Those were indeed refreshing seasons in the respective churches. Constituted in November of 1796, was the earliest, and for a time the only Baptist corresponding body, in a wide extent of thinly-settled country now comprising many large bodies of the same faith and order. Its constituents were five small churches—Chemung (near Wellsburg, in New York and Pennsylvania) recognized in 1791; Fredericktown (which had a meeting-house in the town of Wayne, east of Crooked Lake, N.Y.) founded in 1794; Romulus (Seneca county, N.Y.) founded in 1795; New Bedford (now Owego, N.Y.) organized in Feb. 1796; and Braintrim (in Wyoming county, Pa) organized in 17__. 23d—Oct 6 1819—Smithfield—Rec. Caroline NY—Dis. Bath to the Steuben Assoc. 26th—Oct 2, 1822—Canton—Rec. Asylum, Pa—Burlington became Troy, Pa. Tioga, Pa.
27th—Oct 1, 1823—Big Flat—Rec. Norwich Settlement** Elmyra became Big Flat. Orwell & Ulster became Orwell & Sheshequin, sometimes "Orwell & Wysox"
30th—Oct 4, 1826—Troy—Dis Shippen (Shipping, or Delmar) to Allegany Assoc. ** In which State, not indicated. "Chenango" is supposed to have been near Binghamton, New York, and "Norwich Settlement" west of Tioga county, Pa.
Our file ends with 1830. In the twelve years preceding, thirteen of the thirty-two churches which had belonged to the Chemung, had been dismissed to other Associations on the borders of the original body. Campbellism and Antinomianism, at that day, were rending the churches. From time to time, the members seem to have concluded to disband the old organization and unite with such others as would best promote their peace and the prosperity of the Redeemer’s kingdom. In 1834, was formed the Canisteo River Association, and, in 1835, the Bradford—the latter embracing five churches of the county in its origin, (the same number as constituted the original Chemung Association,) and soon absorbing nearly if not quite all of the regular Baptists in Bradford and Tioga counties, Pennsylvania. In the same year, (1835) a so-called "Chemung Association", claiming to represent eight of the thirty-two churches which had owned that name convened with a "Sullivan church," in Charleston, Tioga county, Pennsylvania. Of these eight churches, three were unrepresented, and one withdrew, leaving only four remnants of churches, with 246 members, as the real strength of the body. Representatives of those 246 persons, however, proceeded to formally disfellowship "what are falsely called benevolent societies, founded upon a moneyed base." And by name exscinded from their "correspondence, the Philadelphia, Abington, Bridgewater, Franklin, Madison,Steuben, and all other Associations," guilty of aiding such organizations! The promulgation of that Bull seems to have been "the fore-ordained means" of arresting the growth of an erroneous claimant to the name of an old and honored but virtually disbanded body. The writer, at least, has not heard of any advancement by it for some years—while those Associations, which it excommunicated, have been signally strengthened and blessed by the great Head of the church. That the original Chemung Baptist Association was an earnest and efficient Christian body, its enlargement, and the precious revivals it enjoyed in its earlier and better days, abundantly demonstrate. A few references to some of its Minutes, clearly show that its principles and practices were directly contrary to the do-nothing policy of the "falsely called" Old School order. The burden of the preaching of the Chemung’s wilderness pioneers, was the same as that of the first Baptist, who missionated over eighteen hundred years ago: "Repent—Believe—Be Baptized." We have the figures for twenty-eight sessions, which report 1338 baptisms—an average of nearly fifty, added to the churches, yearly, of such as it was hoped should be saved. Modern Old Schoolmen do not thus urge repentance and belief upon sinners, and baptisms as a result of religious reformations are lamentably uncommon among them. In 1807, Eld Roswell Goff—the highly esteemed Patriarch of the Association—preached from the text, "We, then, as workers together with Him, beseech you also that you receive not the grace of God in vain"—a text most decidedly of the Fullerite type. In 1808, Ed. Hartwell, from the Massachusetts Baptist Missionary Society, preached, and the Association sent by him a letter to said Society, "requesting missionaries to come to this land, and meet with us at our associations." 1810, the Circular letter was a strong Scriptural argument for the temporal support of ministers of the Gospel by church members. One of the Articles of Faith, (1822) reads: "We believe that they that preach the Gospel shall live of the Gospel, and that it is the church'’ duty to communicate to their ministers, and all other church charges, by equality." In 1812, in reply to a query respecting a minister who had been "repeatedly intoxicated, repeatedly admonished by the church, yet still continues it. What shall they do, supposing he would still wish to confess it?" The Association promptly condemned trifling in such a serious matter, by saying, "We advise you to put him from among you. See I Cor. 5:11." In 1813, "Bro. Smiley read a letter from Bro. Mathias to this Association, containing pleasing accounts from India, and also of singular outpourings of the Spirit of God in some parts of both our Eastern and Southern States. We rejoice in the reviving news. "Under a feeling sense of the ill success of the Gospel in many parts of our land, and of our being involved in War, we recommend to all our churches to set apart the fourth Wednesday of November next as a day of fasting and prayer." In 1815, "a letter was read from Bro. Luther Rice, agent of the Baptist Board of Foreign Missions, accompanied with sixteen copies of their Report. We wish the work to prosper, and have appointed Bro. Smiley a standing secretary to report for us to the Board, and to receive what intelligence it has to send us." This endorsement of missions among the heathen, is often repeated. In 1816, $41 were raised for Associational Missions, and Brethren Goff and Ripley were engaged to labor as itinerants for one month each. In 1817, Bro. Smiley was recommended for compensation for similar services. In 1820, "a sermon was delivered by Eld. D. Dimock, and a missionary sermon by Eld. E. Comstock, and a collection taken." In 1821, was formed the "Chemung Baptist Missionary Society." The members and objects of the Society are defined in two sections: "2. This Society shall be composed of such persons as shall subscribe to this Constitution and pay into its funds at least one dollar annually." (A "moneyed base," surely) "3. The object of this Society is to furnish the means of preaching the Gospel among the destitute within or near the boundaries" of the Association. The Minutes for 1826 contain the financial report of the Society, which we copy to show that prominent supporters and recipients of "benevolent societies founded upon a moneyed base" were among those who afterwards condemned the same and would like to be accounted "Old School Baptists:"
The assistant treasurers were—John Knapp, Franklin; Dea. A. Hibbard, Troy; Eld. Jos. Beeman, Columbia & Wells; James Gerould, Smithfield; Wm. 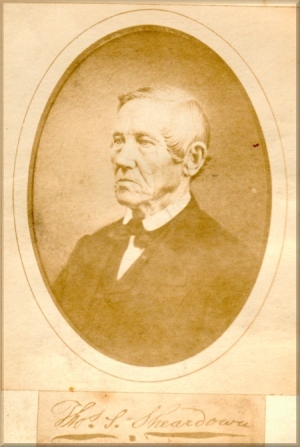 Evans, Esq., Springfield; Dea. I. Baker, Columbia; Dea. J. Luman, Roulet; Eld. H. West, Orwell. In 1830, (our last Minutes) it was "Voted to take up a contribution for the New York Baptist State Convention," and that "we approve of the labors of Bro. James Clark (appointed by said Convention) among us." They also recommend that every church contribute at least one shilling per member to support ministers from abroad. Correspondence of the (Utica) "New York Baptist Register." Dear Brother—The Baptist church in this place has been blessed with a shower of divine grace. Immediately after the Association, in October last, it pleased the Father of mercies to pour out his Spirit, in awakening professors from a state of lethargy, and sinners to a sense of their danger. Twenty-three have been added by baptism, and a number by letter. In May last, I visited the church in Roulett, in Potter county, and found them in a low state. They had not met for one year. There was a meeting appointed, and the presence of the Lord seemed to be manifest. From that time the work increased, and seemed to inspire professors with new life, while the cry with the sinner was, "What shall I do to be saved?" In July, I visited them again, and found many rejoicing in the love of a Saviour. The second and third Lord’s day, I had the satisfaction of burying eleven in the waters of the Allegany, and Bro. Avery, three. May the great Shepherd of the church continue his blessings, until this wilderness shall bud and blossom as the rose; and unto His name be all the glory! The foregoing references are sufficient to prove, that—in sentiment and in action—the real Chemung Association harmonized with the first associated Baptists on this continent, and with evangelical disciples everywhere. Earnest Christians have ever combined "faith and works." The scriptural records of primitive churches show that the entire membership were expected to aid, by their time and by their means, in efforts for the world’s regeneration. The Apostle Paul would compel no one, and would burden no one—"for God loveth a cheerful giver"—yet among his teachings of a practical nature we find these are most explicit: "If we have sown unto you spiritual things, is it a great thing if we shall reap unto you carnal things? "—"Even so hath the Lord ordained, that they which preach the Gospel, should live of the Gospel." In the light of the facts, therefore—and with the figures before us—it seems clear that the so-called "Old School" is but a newly-formed "ism". It doubtless embraces some sincere Christian friends; but does it not become all such seriously to inquire if they have not been misled from the good old paths? They may occupy ground and claim names, hallowed by precious associations, and yet may have lost their first love, as truly as have those organizations on the sites of the seven churches of Asia. Let them return to the counsels and the walks of our heroic, faithful ancestors, who believed in the awfully solemn import of the last command and promise of our Divine Redeemer—"Go ye into all the world, and preach the Gospel to every creature. He that believeth, and is baptized, shall be saved; but he that believeth not, shall be damned. "—"And, lo, I am with you always, even unto the end of the world." In 1791, appeared Chemung, the first Baptist church in that region—and the same year, Eld. Sheardown was born, in far-distant England. In 1796, convened Chemung, the first Baptist Association in the Central portion of Northern Pennsylvania and Southern New York. There are also, mingled with the above, several Welch, German and unassociated churches, as also Freewill and other orders of Baptists. It is a pleasant thought, that, within the probable out-stations of those five feeble, scattered, pioneer bands, there are now over 300 churches, with 30,000 members, and 150,000 adherents of Baptist congregations, gathered within the life-time of the subject of this work, whose labors have been more or less felt throughout much of the field.